Earlier this year I started doing some travelling right about the same time I started playing so I wanted to have my bass with me but was SOOOPER scared of something happening to it. So I bought a nice Gator case with TSA approved locks and everything and found out right away that TSA doesn't care about locking your stuff back, especially if you ask them very nicely to do so - but let's not get into that. 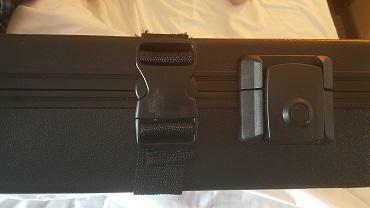 I also want to say that part of this is a failing in the Gator case - the locks are super-dooper easy to pop open with your fingers, or bumping it into something, so unless TSA locks it back (which we have established that they won't, at least in my experience with them so far), it goes “plooey”. After my case arrived back home at the baggage claim with only one latch holding it closed (and no, it was not the TSA lock outfitted one), I decided that something else was needed. I went to the local hardware store, picked myself up a rivet gun (about $20.00), a pack of rivets (about $5.00) some nylon webbing (I bought 8 feet to give myself room for errors) and two sets of buckles. The straps have to be long enough to go all the way around the case as you will be putting the buckles in the front alongside the built in locks. My original plan was to epoxy the straps to the case so that I wouldn't have to drill holes in it, but, turns out that was a terrible idea. You'll see some remnants of that attempt on the straps if I get the pics uploaded. There's actually a little bit of ugliness on mine (stray epoxy, uneven rivets, stuff like that) but I got into a hurry as I was leaving the next day - yours can be better with a little effort). Be careful drilling your pilot holes for the rivets, because the drill tends to pop-through once it makes it through the plastic. This seems like a horrible thing, but if you're careful, you won't pop through the interior shell. 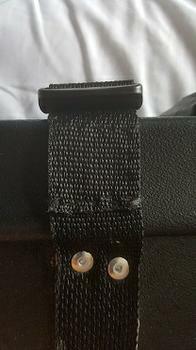 I also would not recommend cutting a hole in the nylon first, because you want the hole to be just the same size as the rivet shaft if not a little smaller, so just drill right through it - NOTE: THE MATERIAL WILL LIKELY TWIST AROUND THE DRILL BIT A LITTLE SO MAKE SURE THAT YOU ARE HOLDING IT TIGHT. Also, I used a needle and some black thread to sew the buckle securely on the bottom, then folded over a “tab” on the top so that I could still adjust the strap a little bit, but not enough so that if every buckle popped open, the straps would leave a gap. When you've cut the nylon straps you might think about giving the ends a quick hit with a lighter because otherwise they can start to fray after a while. It seems scary drilling into your case, but if you do it carefully, it works like a charm, and the best part is that airlines don't want loose straps, so, they'll buckle those back even if they don't care to lock your stuff. 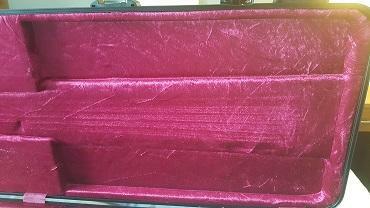 oh, and just so I've said it: REMOVE YOUR BASS FROM THE CASE BEFORE YOU BEGIN!!! I had a bunch of nifty photos but I'm having difficulty with the uploading, so, if anyone has a tip on that, I'm listening. That's a bit of a cop-out, Marko. As our resident expert on posting pictures I thought surely you'd help the guy out. Mammasaid (I get LL Cool J references), you need to use a photo sharing site like Photobucket. Upload your photos to your personal site, then you'll get a link that you can copy and paste into your post. Above the text box that you're typing your post, you'll see a little icon that looks like a pine tree. Click on that, then paste your image's hyperlink into that box. Voila! Or as Marko would put it… Bosh! As far as traveling with your bass, I've never done that on a flight, so I have no input to this. But I have heard some musicians talk about this, and they use the soft bags to carry their bass on the plane. They usually ask the flight attendants if they can store the bass in the coat closet. Sometimes there's room. Sometimes there's not, and you have to put it in the overhead and hope no one crams their bag on your neck. I'd be very nervous traveling with my bass on a plane though. Gutsy move. I went through all that nonsense to no avail, spat my dummy out and had a hissy fit and Johnny gave me a photo button, I store photos on my device and click on the photo button and upload them instantly and painlessly. Hey, IamMark - thanks for the tip. Not to sound lazy, but setting up a whole other social network thing sounds like a lot of work - how about this: if anyone has any questions, hit me up and I'll forward some pics. I have alluded to this before, but this here forum is way, way more social media than I thought I'd get involved with, so…Photobucket? Is that like the Facebooks? Do you see where I'm going with this? Anyway, I've seen people carry their instruments on to the plane before, but my paranoia was “what if they say ‘no dice’ or ‘closet space? are you joking?”, then what am I to do? If you fly Virgin America and Virgin Atlantic, they say you have to buy another seat for your instrument if you don’t want to check it. So, with planes to catch and no time for “uh…uh…uh….no, seriously…please?” at the gate, this was my solution. Your results may vary. Anyway, if you're going to stow it, this has worked for me so far, and that's including a fairly convoluted set of international flights. ALSO: my bass teacher recommended that if I were going to stow my bass in the cargo compartment to de-tune it a step first to avoid any string-stretch in the process of pressure changes in the cargo compartment. And last but not least - Marko: is that Shane McGowan? Hey! here are some pics! This is where I folded over the strap in one half of the buckle and sewed it together to secure it - I figured only one side needed to be adjustable. Also, a detail of my dreadful riveting job. 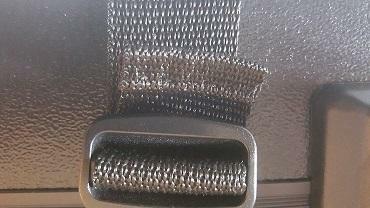 A detail of the strap “tab” - I folded the end of the strap twice and sewed it together.